Community members and Evergreen staff personnel celebrated the 25th Anniversary with cake and the sharing of memories. 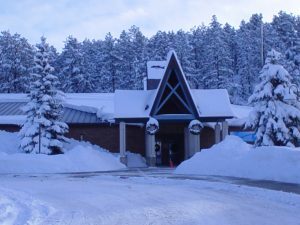 Nestled snug in the town of Evergreen, one of Jefferson County Public Library’s mountain locations, the Evergreen Library, celebrates 25 years in its current building. Library staff and community members commemorated this date with a special Holiday Open House on Dec. 3. Celebrants expressed their favorite memories on a memory board, viewed old photos and shared a special cake for the occasion. "I first came [to the Library] for Story Time when I was little. As I grew older, the Library has become like a second home as well as a fount of joy and knowledge," writes Madeline. Another anonymous patron writes, "[It's] so peaceful - a place I can go when I'm lonely. Thank you." 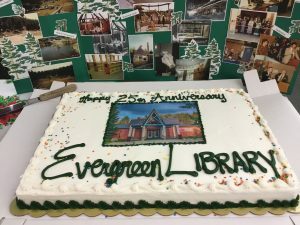 Evergreen Library continues celebrating its 25th anniversary in the current building throughout the month and into the start of 2019. Swing by to contribute your own or view more community memories on our memory board. The old Evergreen Library, which is now the Sheriff's office, was located on the property adjacent to the new building. The friendly staff, robust materials and collections, breathtaking views and famous "fireplace-room" make our Evergreen Library worthy of a visit at any time. 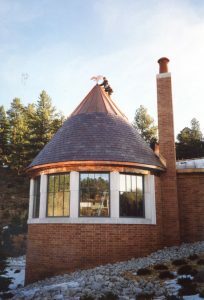 But in 1993, the new Library stood out in the community for such features like an “air conditioning system [that was] operational,” a children’s area with Story Tower, its unique landscaping, reading den, and a "book return to use when the library is closed." The newly-designed Evergreen Library boasted a meeting room with seating for 45 attendees and access to all of the Jefferson County Public Library materials, which at the time amounted to 700,000 items. In his notes regarding the new building design, architect Cabell Childress writes, "[We] placed a 'tower' for children, a view 'turret' for adults and entry 'gate' for all." Today, the Evergreen Library remains central to the community. In 2017, the Library reported 186,453 visitors, 386,295 items in circulation, and 957 programs, with a total of 16,422 in attendance. “It’s quite the community [in Evergreen]. Being a child-services librarian, I’ve been able to watch families and patrons grow up through Story Times,” Carol Burdick, kids and family librarian, shares of her experience working at Evergreen over the last 25 years. Carol is one of three staff members at the Library who were there 25 years ago for the opening of the new building. She, along with Polly Tagg, adult services librarian, and Michelle Godden, patron experience associate, have even kept the hard hats they were given during the reconstruction. 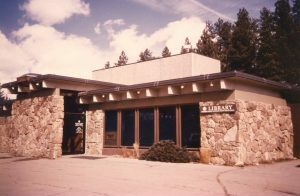 While the Evergreen Library still remains the quiet and quaint, community-centered destination it was in 1993, like the rest of our JCPL system, the Evergreen Library has experienced immense growth and change. “My job and tasks vary so much from what they were back then, which is why working in the Library has been very rewarding. It’s always changing; always innovating,” Michelle said..
Want to hear more about Evergreen happenings? Stay connected when you subscribe to our Mountain e-Connect newsletter. *Evergreen Library houses old copies of the Canyon Courier relevant to the Library as well as old Library information, which is available upon request.